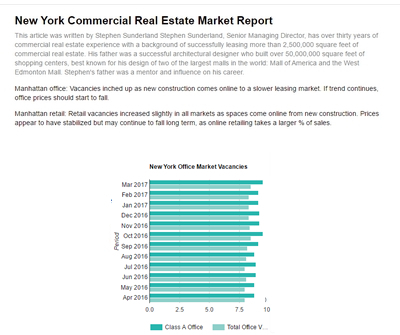 Rents drop and Landlords are nervous as more than 3.5 million square feet came back on the market, with negative absorption of 1.8 million square feet. Rents are likely to continue to fall as additional continues to come back on the market in the coming months, from the recent layoffs in banks and former investment banks. 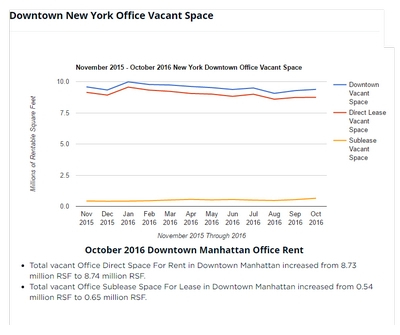 Asking rents in Class A office buildings in Manhattan declined while vacancies rose to their highest level since March 2006. Rents were down 5.6 percent to $83.38 from the May 2008 high of $88.37. 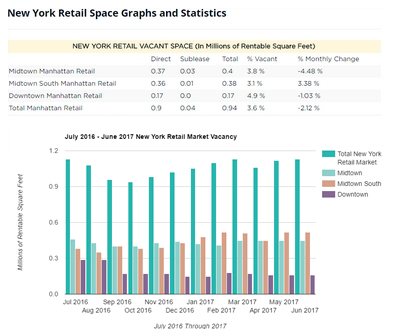 Total vacancies were up 29 percent from the start of the year to 8 percent, or 18.4 million square feet. 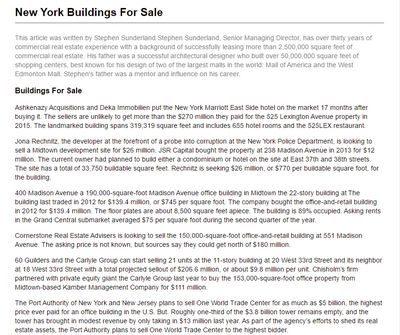 The last time so much was available was March 2006 when vacancies hit 18.2 million square feet. 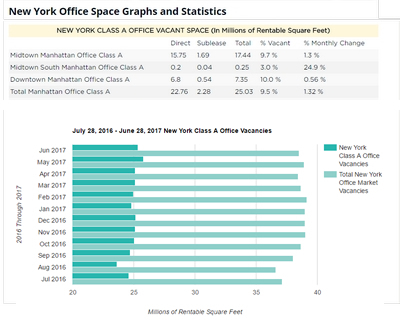 There was 4.4 million square feet of sublease available in Midtown Class A properties, which made up 28.2 percent of all available Class A in the area. 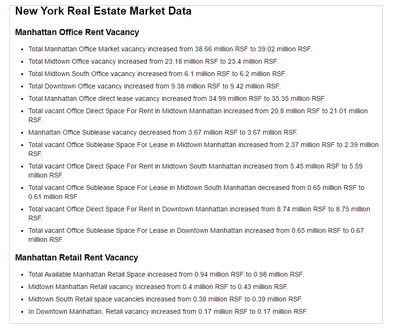 As vacancy increases, more sublease will become available come to market next year. 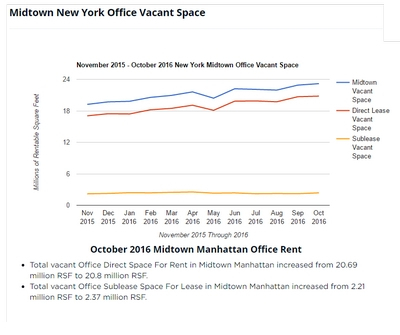 Midtown saw the greatest amount of office returned to that submarket since January 2003, fueling an increase in vacancies and a decrease in asking rents throughout Manhattan. 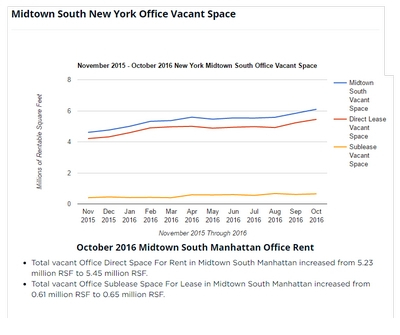 Midtown experienced a net absorption of negative 1.85 million square feet in October, driving up the overall Manhattan vacancy rate to 6.6 percent from 6.1 percent in September. 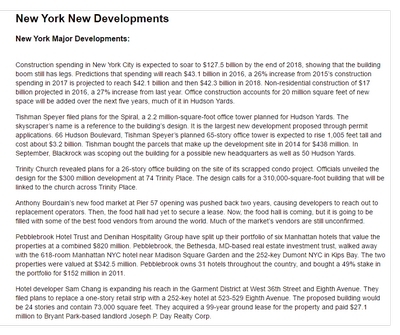 A number of hedge funds are trying to shed in the city's trophy buildings. 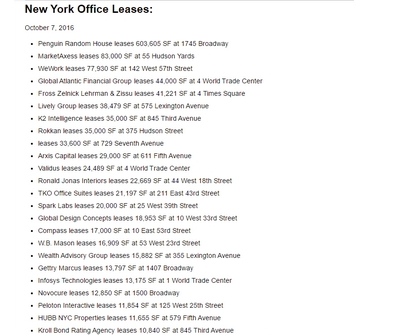 Before the financial crisis, many hedge funds paid up to $200 per square foot in rent for offices in some of Midtown's trophy buildings. 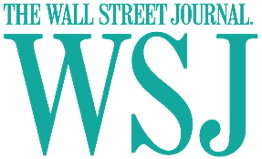 A record 70 percent of hedge funds reported losses in September, and now at least 300,000 square feet of these spaces in buildings like the General Motors Building and the new 30-story tower 510 Madison Avenue, are up for grabs. 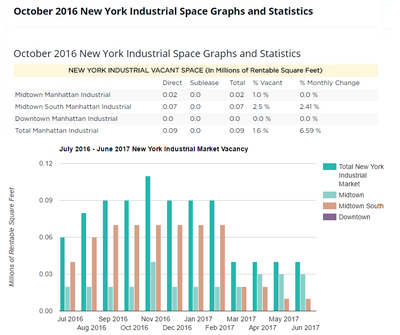 Average asking rents for retail in Manhattan fell modestly in September compared to the same month last year. The reason the rent drops are not more severe is that landlords are giving more in concession packages, a trend which will likely continue. Fifth Avenue remains the world's most expensive shopping street. 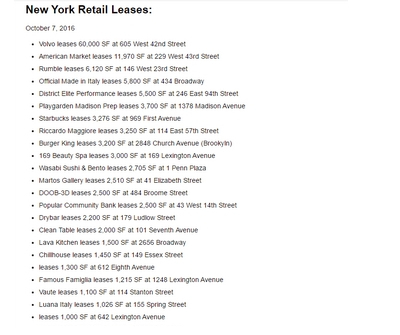 Retailers can now expect to pay average annual rents of $1,850 per square foot, a 27 percent increase from 2007. Ground-level Fifth Avenue rents can go as high as $2,300 per square foot. Having a presence on a street like Fifth Avenue is important for a brand, regardless of how profitable the store is.